Bees and Hives at Kew. A couple of weeks ago, I visited the Hive at Kew Botanical Gardens, London. Kew is one of my most favorite places and this visit was exceptional because of the Hive, an installation by the artist Wolfgang Buttress. He was inspired by the work of Dr. Martin Bescik of Nottingham Trent University. Dr. Bescik has developed technology to monitor the health of beehives. The Hive is linked to local Kew beehives which cause LED lights to flicker in time with the vibrations created in the hives. You can also hear the buzz of the hive which goes from a soft hum up to a loud bee crescendo at times, it was a truly unique feeling, as if being inside a giant hive. The Hive is surrounded by a meadow of British wild flowers and bees, lots of them. Their are guides that talk about the need to protect pollinators and the life of bees. Some propolis was passed around in a cup, it smelled a bit medicinal and also slightly of Marmite. Apparently the bees use it to seal their hives, making them watertight and impenetrable. If a mouse enters the hive, the bees kill it and then wrap it in propolis, preserving and mummifying it, keeping it from polluting their hive. All interesting stuff to a bee lover like me. I was in bee heaven. Comments Off on Bees and Hives at Kew. I drew Mother Holle in pen and colored ink on Ampersand’s clayboard . It depicts the fairytale of Mother Hulda, also known as Mother Holle (aka Frau Holle, Hulda, Hol, Hel, Holda, Hilda) She’s a Germanic Goddess who appears in the Grimms fairy tale # 24. I decided to show a scene from the fairy tale where it is said that when Mother Holle makes her bed it snows. So here she is leaning out of her window shaking and fluffing up her feather pillows and making it snow on the Medieval winter scene below. This winter farm scene is adapted from the illumination”February” from the Medieval Book of Hours, Très Riches Heures du Duc de Berry. The seated woman stirring her cauldron is the English Mystic, Margery Kemp 1373-1438 who led a very interesting life for a woman of her time. The border illustrates the old English carol “The Holly and the Ivy”. Mother Holle was printed on a line of Solstice cards and was also on Storytelling Magazine’s January 2013 cover. Comments Off on Mother Holle. Hello, long time no see! I’ve been very busy this year with lots of projects, plenty of travel and a new baby grandson. I celebrated my 60th birthday, surrounded by friends and family. I finally purged and organized my studio, it needed it after 20 plus years! I’m donating tons of art stuff to a local recycled art supply store. I will have lots more light, two 48″x48″ windows are being installed this weekend. I’ll set up my easel right in front of them. Photos to follow. All in all its been a very good year, hope it has for you too! Comments Off on Merry Winter Solstice! 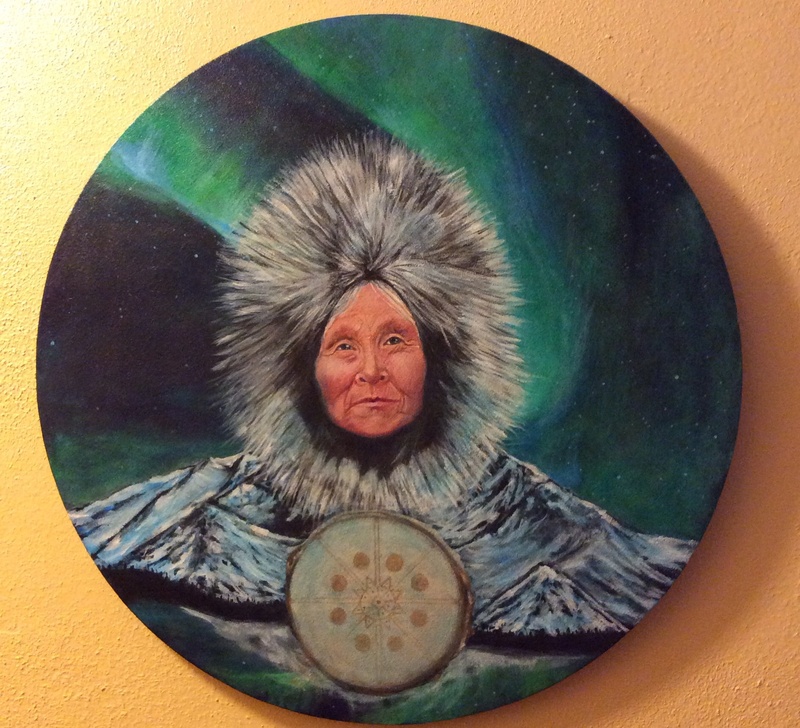 In the middle of the coldest Winter in recent memory, I appropriately started off my year by completing another in my series of Grandmother Elemental Shields paintings, Grandmother Ice. It’s painted with Golden Open Acrylics on a circular canvas. Grandmother Ice, acrylic on canvas 20″x20″.Copyright Jane E. Ward 2014 and beyond. 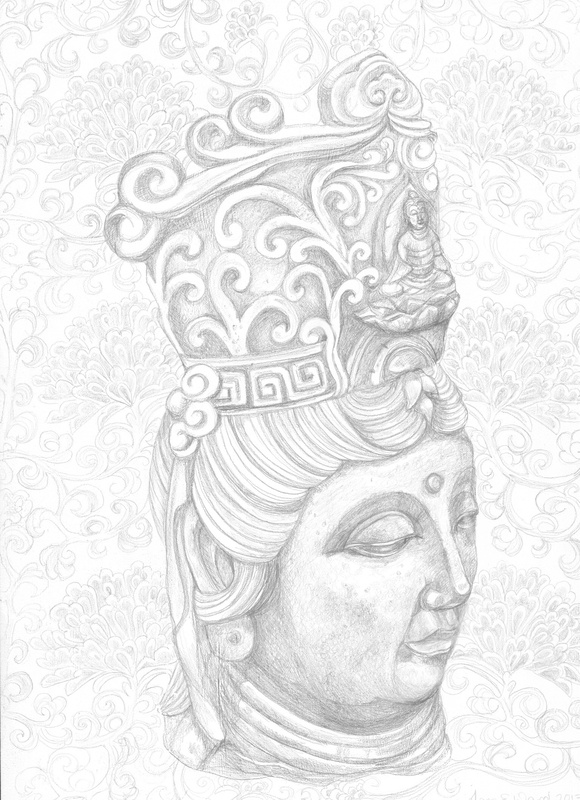 This silverpoint drawing, completed in 2013, Kwan Yin with Chrysanthemums was in the Round Rock TX Drawing Show in the Spring. Kwan Yin with Chrysanthemums, silverpoint drawing. Copyright Jane E. Ward 2014 and beyond. I took a wonderful Smalti workshop at the Chicago Mosaic School in the Summer and bought my first hammer and hardy. Now I’m ready to make some new mosaics with Italian Smalti. 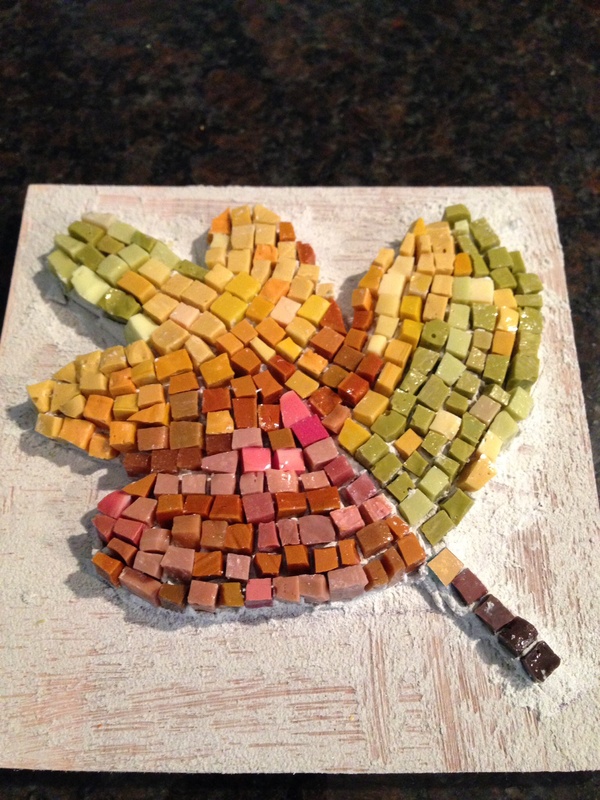 Fall Leaf, smalti mosaic in progress. Fall is here now, although the temperature has yet to go below 80 degrees here in Texas, and I have some of my jewelry in a show at the Texas Art Asylum, October 17,18 and 19th. 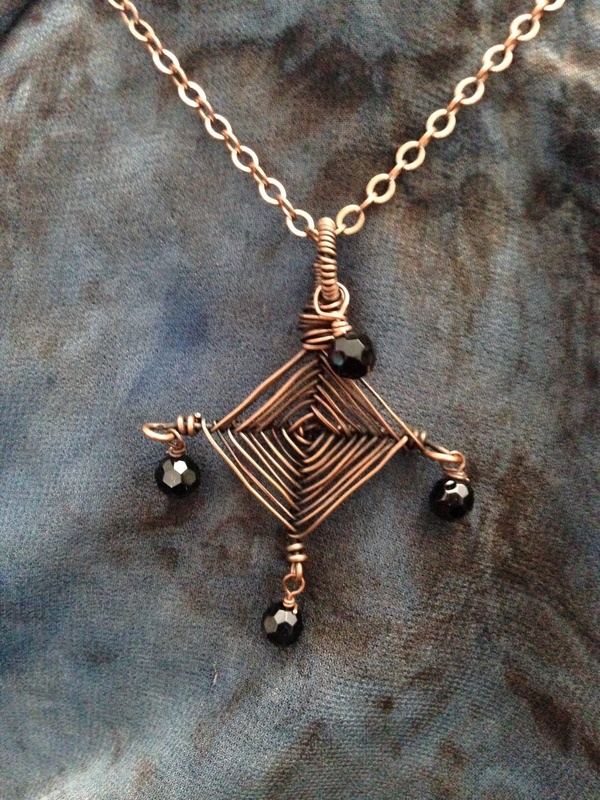 Ojos de Diosas, copper wire and jet beads. Copyright Jane E. Ward 2014 and beyond. I’ve worked on several other projects, you can see one in my last post, and have even more in the planning stages, so all in all so far 2014 has been a very busy and fun year. Comments Off on My year so far. I’ll be blogging here again since dismantling my website. Here’s the latest mosaic piece, it’s to go in the gap between a stove and the hood. The middle is metal with a faux patina applied, a good place to put a recipe or a reminder attached with a magnet. It’s 15″x15″, glass and ceramic tile. It’s been a while but here I am. Summer is now winter and it’s turned chilly here, we had a freeze last night and it’s just the right weather to curl up by the fire with a good book. 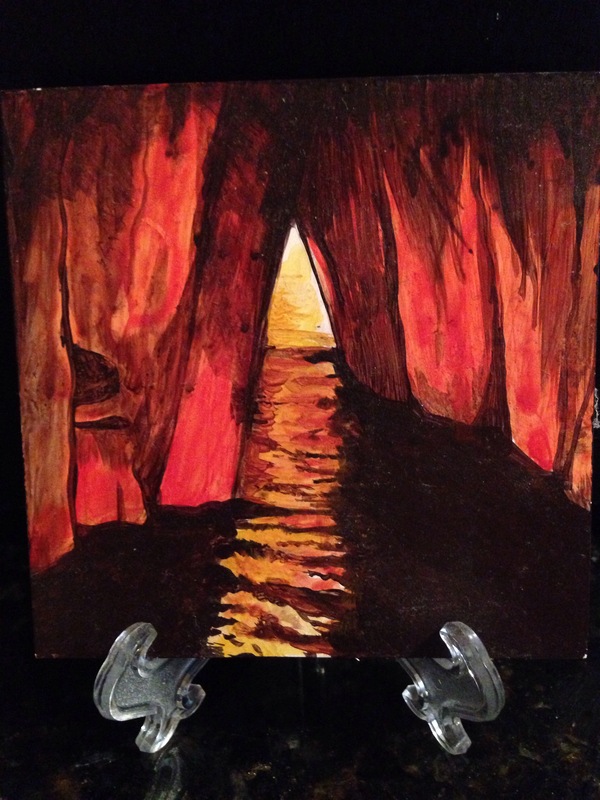 “Hestia at her Hearth” is the first in a series of storytelling art about an ancient Crone and her fairy friends. In each drawing, Hestia will share her world with the divas and fairies of each of the Elements of Fire, Water, Air and Earth. In this one, happy fire sprites cavort in the flames of her hearth as she, nice and toasty, reads a book about the Lore and History of Dragons to her companion Uruloki, a young fire-drake, at at her feet. In Greek Mythology, Hestia is the ancient Goddess of the Hearth. In ancient Greece her fire was never allowed to go out and every home had a shrine to her in the hearth. She was represented simply as a flame and later was depicted as a veiled Matron. When a young woman married she would carry burning embers from her mothers hearth, through the streets in solemn procession, to her new home, to light own hearth. The Ancient Greeks would also carry the Sacred Flame from the Pyretaneum within Hestia’s Temple, to wherever they settled and at the height of their Empire this could be very far afield. She was present at the very moment we discovered the element of fire could be captured from a lightning strike catching fire to the shrubbery and brought it home to our caves, this was even before we knew how to create fire for ourselves, although I’m sure that skill came pretty soon after the discovery, probably when the first hearth fire went out! From that moment on, we gratefully worshipped her, knowing that without fire, life was much harder and we were at the mercy of the weather, wild animals and all else that lurked in the darkness. As well as the promise of safety she also gave us fire skills that included cooking, pottery making, glass making, smithcraft and forging and infinitely so much more. She truly was the Mother of Invention. 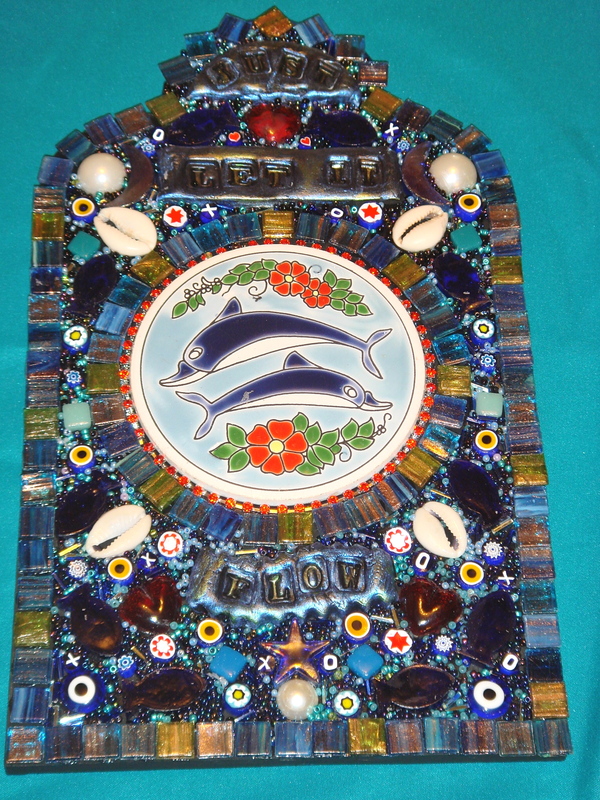 I finished out my series of mosaic plaques with the Cretan tiles. 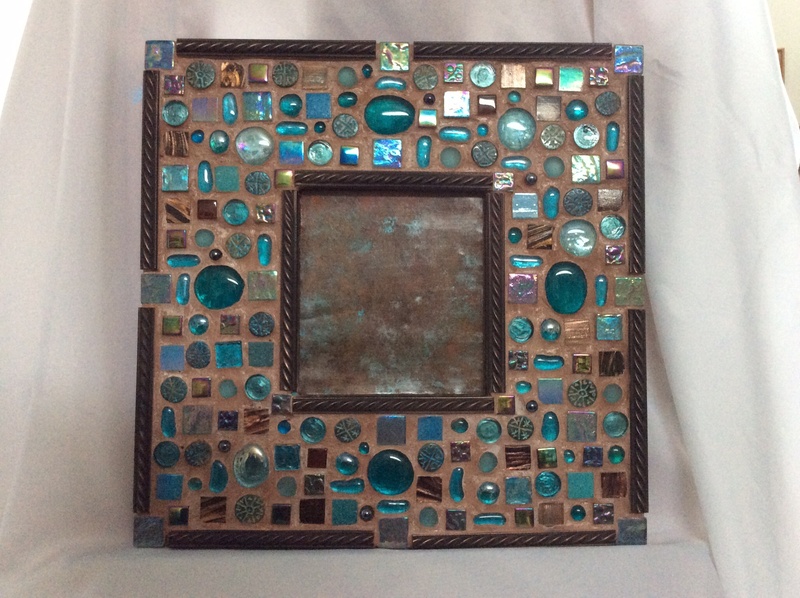 This is a mixed media mosaic with ceramic tile, millefiori glass, beads, shells, jewelry pieces. The title ” Just Let It Flow” is my mantra and it also sums up my creative process. I found Flow by falling in love with my process. 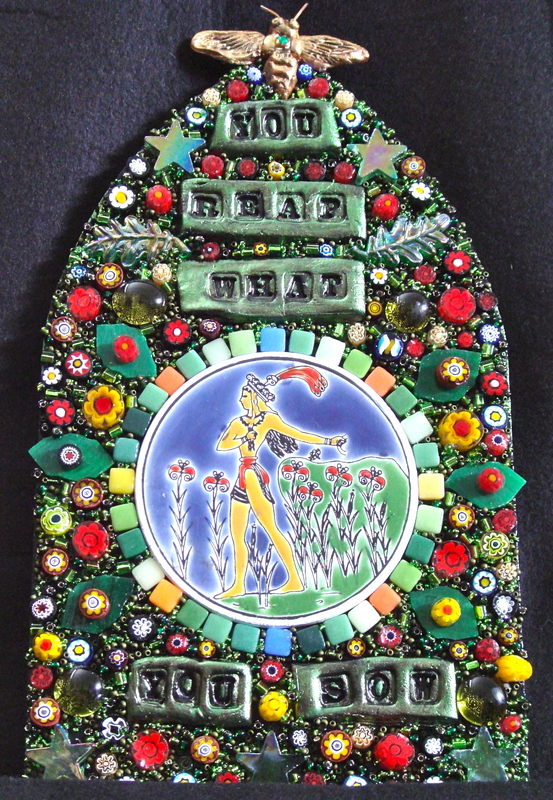 This is also a mixed medium mosaic with many of the same materials as above, the words are stamped in Aves Apoxy Sculpt. This piece was made at the beginning of the growing season and as I thought ahead about reaping the harvest, I thought of my bees. Once these pollinators are all dead from Colony Collapse Disorder, by systematically poisoning them with pesticides, we will eventually not have very much left to reap. And finally this mosaic took up quite a lot of my time, it’s made from hand cut stained glass tessera and beads for the pomegranate seeds. Originally this was going to be a hearth for my new fireplace but I changed my mind and hung it on the wall above. The title, Persephone’s Pick, refers to Persephone’s choice to eat the pomegranate seed and remain in the Underworld for half the year as Hades wife instead of returning to the world for good. I have often wondered why she made this choice. So as you can see in my defense dear reader, I have been very busy but still, it’s not a good enough excuse for not writing just a little, every once in a while and I promise to do better in future.